Ann Arbor, MI, and Odense, Denmark, March 14, 2017: Occupying one of the largest booths at Automate 2017 in Chicago, April 3-6, the Danish cobot manufacturer will showcase more than 20 new Universal Robots+ products from 14 different developers. The UR+ platform is a new online showroom that takes the trial and error process out of creating a robot application by providing access to products verified to work optimally with UR robots. From grippers to software, sensors, vision cameras, and accessories, Universal Robots+ not only enables end users to hit the ground running when integrating UR robots, it’s also an un-paralleled collaboration between Universal Robots and the flourishing developer ecosystem. “What really differentiates us is our focus on growing this network of technology partners to ensure fast and easy deployment of our robot arms. We’re hoping to grow the platform to feature around 100 UR+ solutions by the end of 2017,” said CTO and co-founder of Universal Robots, Esben Østergaard. One of the partners currently in the UR+ process is FESTO. 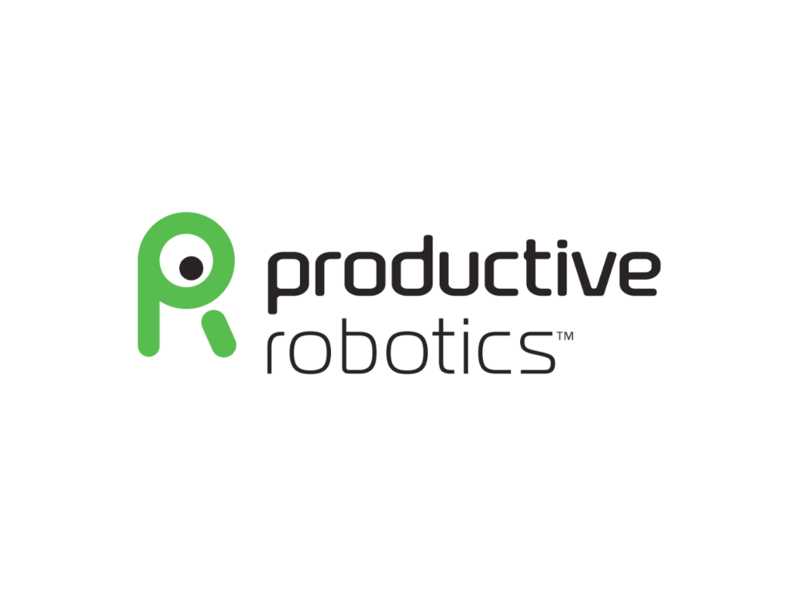 At Universal Robots’ Automate booth #1245, the company will show a new reliable and cost-effective solution for extending the reach of UR 6-axis robots through a horizontal or vertical 7th axis. This new solution is based on the FESTO electric linear-axis EGC-HD and CMMP-M3 servo-drive with the company’s advanced safety module. The servo-controlled actuators have been seamlessly integrated within UR’s programming environment and are compatible with the full range of UR robots. Automate is also the launch pad for the new low-cost, multi-axis force torque sensor Axia80 from ATI Industrial Automation that will debut at the UR booth embedded with a UR5 robot. Featuring an interactive booth demo, attendees will be able to move a work piece and force the cobot to adjust its path while it maintains a constant force. Unlike load cells, which only operate on a single axis and measure only push, the Axia80 senses torque and side loads along all six axes. To further document how UR+ products can work in tandem, a lineup of UR3 robot demos, each equipped with up to five different UR+ products, will also be ready for attendee interaction. The demos feature solutions from Millibar, Airgate, SICK, OnRobot, Robotiq, Weiss Robotics, OptoForce, Reiku, Schunk, Igus, Roboworld and Afag. Along with the development of UR+ solutions, Universal Robots is also growing its network of Certified System Integrators (CSIs). Kubica Corp., a UR CSI, will showcase an interactive augmented reality application featuring a UR10 robot assembling a door panel assisted by a Light Guide System (LGS) from OPS Solutions, an augmented reality tool. By projecting a digital operating “canvas” directly onto the workspace, LGS combines the best of human intelligence and automation technology to direct the robot and the operator through the required assembly tasks. “We chose to show a door panel build as this is a labor-intensive process prone to human error, which is now significantly reduced by having the UR cobot handle several of the assembly tasks, working in tandem with the operator. We found that the UR10 robot has some built-in features that make it the perfect robot to accomplish this task,” said Scott Lown, Controls Engineer with Kubica Corp. The Universal Robots booth is not the only opportunity for Automate attendees to interact with UR robots. Close to 20 other Automate exhibitors will also be exhibiting the blue cobots at the show. 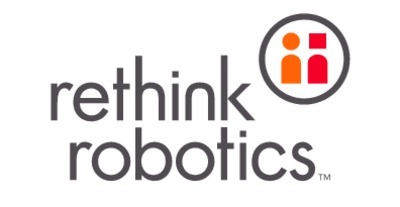 “The fact that so many high-profile industry players now choose to feature UR robots in their booth applications is a significant testament to Universal Robots’ versatility and widespread market appeal. I look forward to walking the show floor and seeing our robots everywhere,” says Esben Østergaard. UR5 with a robotic picking solution integrated with an Autofulfillment™ SPrint™ Automated bagging system solution, demonstrating End of Line processing & packaging of picked orders in a tote. The system automatically takes items from tote, scans, packs, labels, verifies, & seals for fast & accurate order fulfillment. UR3 robot with Robotiq gripper 2FG and OptoForce Force/Torque sensor. With live programming of assembly applications, every visitor gets the chance to program the UR robot within a couple of minutes, demonstrating how the ArtiMinds software interface addresses process variances in real-time based on readings from the force-torque sensors, adapting the robot’s motion like a human. UR5 robot with ATI’s new low-cost, Multi-Axis Force/Torque Sensor, Axia80. Attendees can move a work piece and force the cobot to adjust its path while maintaining constant force. The Axia80 measures the full six components of force and torque (Fx, Fy, Fz, Tx, Ty, Tz) using a monolithic instrumented transducer with silicon strain gauges for excellent noise immunity. The use of silicon gauges also allows the F/T transducer high stiffness and increased overload protection, between five and 20 times over the sensing range. The Axia80 has Ethernet communication with fully integrated software interface for all Universal Robots models. All electronics are built into the transducer body keeping cost down and footprint small, while excelling in accuracy, resolution, and robustness. The Axia80 will be available as a package including all interface plates and cables necessary to quickly connect the transducer to a Universal Robot. 3D Infotech will utilize a UR3 robot with Creaform’s HandySCAN 700 3D laser scanner to demonstrate how their UR+ enabled Streamline automation software makes it easy for anyone to automate high accuracy 3D scanning and inspection. Customers that already own Creaform’s scanning products now have an easy upgrade path towards automation with Streamline’s ability to interface directly with any collaborative robot from Universal Robots. UR5 robot in packaging application, performing a variety of stacking, transfer and loading tasks. UR5 robot integrated with Dorner’s Precision Move Pallet Systems conveyor demonstrating an assembly automation and product testing application. UR5 robot with OptoForce Force/Torque sensor demonstrating an adaptable path force-control application. Using a padded roller, the UR5 robot will adjust the path of the robot to apply consistent force along an un-even path with rising and falling slopes. The interactive application will allow visitors to put their hands in the path of the roller to demonstrate the robot’s “sense of touch,” using the F/T sensor to adjust the robot travel safely to go over their hand. UR5 robot demonstrating live robotic induction to a EuroSort Bomb Bay Sorter. UR10 in a robotic goods-to-picker application. 3D Infotech will showcase a UR3 robot with LMI Technologies’ all-new Gocator 3210 snapshot sensor. High-quality data is acquired using 3D Infotech’s UR+ enabled Streamline software interface, demonstrating how UR robots make it safe and easy to automate inspection for many applications including automotive, aerospace, castings & forgings, and consumer electronics. UR5 robot with Microscan’s latest MicroHAWK machine vision smart camera platform, demonstrating flexible in-line inspection. The robotic demo features the world’s smallest Ethernet smart camera and is set up in collaboration with Olympus Controls. Two UR3 robots and one UR10 robot with OptoForce 6 Axis Force Torque Sensor and OnRobot RG2 gripper. Demos show how the On Robot gripper takes advantage of the internal architecture of the UR robots by simply connecting to the robot’s I/O port. OptoForce equips industrial robots with the sense of touch so that more tasks can be automated. The application shows adjustable force, speed and widths of gripper with feedback and drop detection provided on the gripped part. UR+ enabled OptoForce Force Torque sensor uses optics instead of strain gages, and provides all six variables for X, Y, Z force and torque easily incorporated into the application program. The work cell will also demonstrate how UR software provides a hand guide with any or all of the six axes enabled to make programming waypoints and path recording easier than ever. UR5s and UR10s robots as part of a piece-picking solution that can handle a large range of items reliably and at high rates for the e-commerce supply chain industry. RVT will debut its brand new collaborativeVisionFactory 3D VGR software driving a UR5 robot with an OnRobot RG2 gripper. Demonstrations will highlight the powerful combination of vision and the UR for a variety of applications such as collaborative assembly, pick and place, and gluing. Three UR5 robot applications all equipped with UR+ enabled Robotiq Grippers, Wrist Camera and Force Torque Sensor. A UR5 robot in a machine tending simulation utilizes vision-based part location, an automated vise, and force-based placement of the part. The work cell demonstrates how to improve cycle times in CNC machine tending using two grippers on the same UR arm. 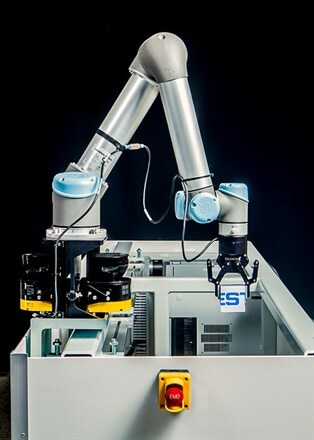 Other applications show UR5s utilizing the Path URCap in dispensing and deburring simulations, showcasing how to program a complex path by hand-guiding the robot instead of teaching hundreds of waypoints. Visitors are encouraged to try the applications themselves. UR5 robot with electric SCHUNK gripper CoAct EGP. The work cell demonstrates how a UR 5 can be used for loading and unloading a lathe without the need for fences. The gripper and robot are used to load parts and open and close the machine door. UR3 robot with Soft Robotics gripper built with UR+ ready Soft Robotics Development Kit. This demonstrates the collaborative pick-and-place of a wide range of objects of varying size, shape and weight, with a single end-of-arm tool and no additional programming. Tend will be displaying a UR5 robot with an attached Chameleon3 USB3 vision camera. Using the in.control™ software platform that Tend is launching at the show, the UR5 will simulate a machine-tending task by reading a touchscreen display and responding according to the text prompt on the screen. UR10 robot with a ZIMMER GROUP long-stroke collaborative gripper. The display demonstrates the ease-of-use and programmability in implementing a UR cobot combined with ZIMMER GROUP’S line of UR+ ready grippers and UR specific attachment kits.